The world’s first independent floating nation which will launch in the Pacific Ocean in 2022 will operate outside of government regulations using its own ‘Vayron’ cryptocurrency. The plans will see the sea-bound city state, with 300 homes as well as a handful of hotels, restaurants, offices and more, built in the Pacific Ocean off the island of Tahiti. Bankrolled by PayPal founder Peter Thiel, the £37 million ($50 million) project is a pilot program in partnership with the government of Polynesia and is championed by a movement of academics, philanthropists and investors. In a new interview, Nathalie Mezza-Garcia, a political scientist and researcher for the Floating Island Project, says the island’s residents will be free of ‘fluctuating geopolitical influences and trade issues’ and claimed the nation could one day house refugees displaced by climate change. Speaking to CNBC, Ms Mezza-Garcia, a researcher at Warwick University, said: ‘There is significance to this project being trialed in the Polynesian Islands. This is the region where land is resting on coral and will disappear with rising sea levels. The scheme is the creation of the nonprofits Seasteading Institute and Blue Froniters, which alongside Thiel’s investment fund the project through philanthropic donations via tokens of their own cryptocurrency, Vayron. The radical plans are expected to be completed by 2022 and cost as much as £37 million ($50 million). The island’s structures will feature ‘green roofs’ covered with vegetation and construction will use local bamboo, coconut fibre, wood and recycled metal and plastic. It could see the creation of an independent nation that floats in international waters and operates within its own laws to ‘liberate humanity from politicians’, according to the Seasteading Institute. WHAT IS THE FLOATING ISLAND PROJECT? A group of academics, philanthropists and investors plan to build an independent floating nation by 2022. The £37 million ($50 million) plans will see the sea-bound city state, with 300 homes as well as a handful of hotels, restaurants, offices and more. 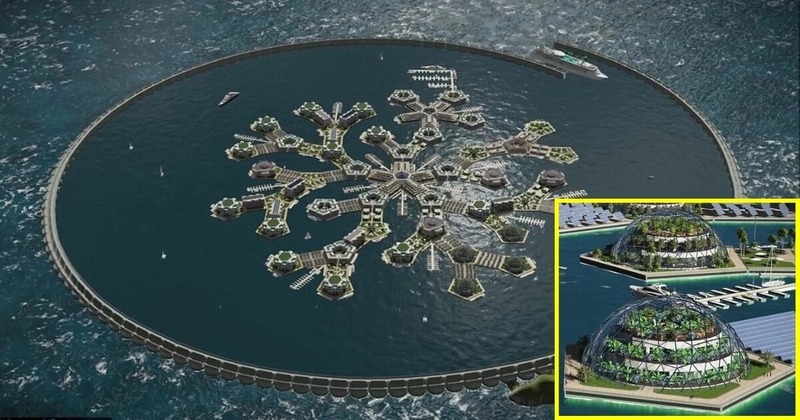 Bankrolled by Paypal founder Peter Thiel, the Floating Island Project will operate outside of governments laws and regulations, and is due to be built in the Pacific Ocean off the island of Tahiti. It’s envisaged that between 250 and 300 people will call the first floating city home. The prototype nation has partnered with French Polynesia, a collection of 118 islands in the southern Pacific, which is interested in the project as the area is at risk from rising sea levels. The island – the brainchild of nonprofits organisations the Seasteading Institute and Blue Froniters – is being funded by philanthropic donations via tokens of the project’s own cryptocurrency, dubbed Varyon. A number of the island’s dozen non-residential buildings are designed to function as business centres, allowing companies to work outside of government regulations. ‘This means there is stability, outside of fluctuating geopolitical influences, trade issues and currency fluctuations – it’s the perfect incubator,’ Ms Mezza-Garcia said. She added that the project is an exciting prospect for those disenchanted with the political sphere of today. ‘If you don’t want to live under a particular government, ‘people will be able to just take their house and float away to another island,’ Ms Mezza-Garcia said. The Seasteading Institute, co-founded by Paypal founder Peter Thiel, has spent the past five years creating designs for ‘permanent, innovative communities floating at sea’, joining up with Blue Frontiers – a new startup that specialises in building floating islands – last year. Seasteaders are a diverse global team of marine biologists, nautical engineers, aquaculture farmers, medical researchers, investors, environmentalists, and artists according to The Seasteading Institute’s website. ‘Our goal is to maximise entrepreneurial freedom to create blue jobs to welcome anyone to the Next New World,’ the group writes on its website. Mr Theil, a venture capitalist who co-founded PayPal, has funnelled $1.25 million ($812,920) into the Institute and has previously called Seasteading an ‘open frontier for experimenting with new ideas for government’. In a written statement, a spokesman for the Seasteading Institute said: ‘During several visits to French Polynesia and after getting acquainted with the environment and the local contexts, one thing was sure, the project has to blend into its environment. ‘To achieve this, local environmental characteristics, climate, ecology and cultural context have all been studied and play a major role in the process. Larger platforms with mixed-use buildings aligned to the celestial pillar Pou, starting from the main platform, the ‘star headlight’ or Ta’urua, and ending by the guide star Avei’a, passing through the zenith of the floating island. Speaking in November, Joe Quirk, president of the Seasteading Institute, said he wanted to see ‘thousands’ of rogue floating cities by 2050, each of them ‘offering different ways of governance’. ‘Governments just don’t get better,’ Mr Quirk told the New York Times.